Green Infrastructure Ontario’s Michelle Sawka collaborated with Municipal Natural Assets Initiative’s Roy Brooke in a recent article calling for defined values for green infrastructure when making development decisions. This means recognizing green infrastructure as a definitive asset, and giving it a place in Canada’s accounting framework. Click here for to check out the article. Natural disasters are frequently the impetus for recognizing the critical value of natural infrastructure’s value. With California in its sixth year of drought and facing devastating wildfires, the State has officially recognized watersheds as an integral component of water infrastructure. This is an incredibly important move, as it will allow funding set aside for traditionally grey infrastructure to be used for the maintenance and recovery of the natural infrastructure integral to watershed health. Read more about this new legislation here. 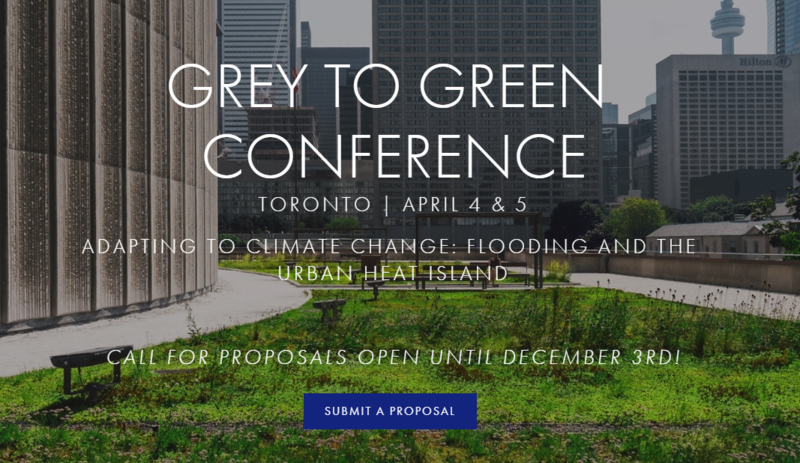 Featuring the latest research and developments, the Grey to Green Conference aims to bring the green infrastructure sector together to help make the case for green infrastructure investment. This year’s conference is titled “Adapting to Climate Change: Flooding and the Urban Heat Island”. These are issues that continue to worsen with climate change, impacting human health, community safety and economic prosperity. Thankfully, green infrastructure can help. Make sure to mark your calendars and join the discussions!